Saudi Arabia and the Israeli regime are in clandestine talks to establish official economic relations for the first time since the entity was created on the Palestinian territories some 69 years ago, a report says. 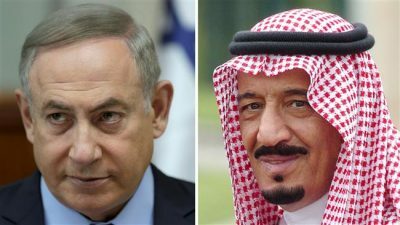 The Times, citing unnamed Arab and American sources, said in a report on Saturday that forming economic connections between to two, which would be gradual and step by step, could begin by allowing Israeli companies to open shops in the Arab kingdom, or granting El Al Israel Airlines Ltd. permission to fly over Saudi airspace. “However, any such progress would bolster the alliance between Iran’s two most implacable enemies and change the dynamics of the many conflicts destabilizing the Middle East,” the report speculated. So far Saudi officials have had some open meetings with senior officials in Israel, trying to gradually pave the way for establishing ties with the occupying regime. Back in May last year, Israeli newspaper Arutz Sheva reported that Saudi Arabia and its Persian Gulf allies, namely Jordan and Egypt, had been sending messages to Israel through various emissaries, including former British Prime Minister Tony Blair. They had asked Tel Aviv to resume Middle East negotiations under new terms, which included changes to the Saudi initiative. In July last year, Anwar Eshki, a well-connected retired general in the Saudi military paid a visit to Israel, meeting with Israel’s Foreign Ministry director general Dore Gold and Yoav Mordechai. He also met with a number of Knesset members. Israeli daily Ha’aretz at the time described the visit “a highly unusual one,” as Eshki could not have traveled to Israel without approval from the Saudi government. Saudi Arabia has not yet recognized Israel since its foundation in 1948. Saudi authorities thus do not accept Israeli passports, and holders of passports containing any Israeli visa or stamp will be denied entry. However, any prospect of official ties between Tel Aviv and Riyadh will also mean that Saudi leaders might have on their agenda a review of their recognition of the Israeli regime.